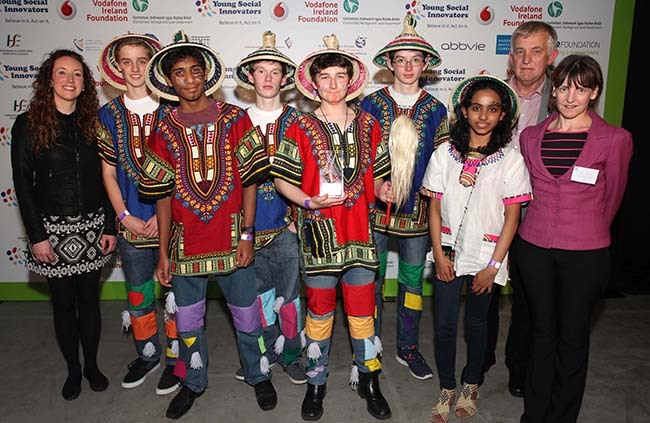 Our friends in Portmarnock Community School took their #MapLesotho participation to a new level by winning their section of the Young Social Innovators #YSI contest last week. The category that they entered was called “Making Our World One World” among very strong competition from three other schools. The competition had a series of finals and the students won through to the final decision which was formally announced at the #YSIshowcase in the CityWest Hotel in Dublin. Their performance was called “Global Citizens Mapping the future”. It involved some dance, dressing in Basotho clothes and delivering a speech about #MapLesotho. This was followed by tough, but interesting questions from the YSI dragons and audience about that they had learned, where they see themselves in five years time and whether there are challenges in communicating the project. After the event Niall FitzGerald and Collette Cronin who teach the students at Portmarnock were joined by his excellency and Lesotho Ambassador to Ireland Paramente Phamotse. All three related how very proud of the whole effort they were by these very talented young people.